They have a very general low cost to the allies and items which can lead to empty hand when also combined with discarding outlets. Notes: As a Turn 1 drop, Rotling is not very good. He has a cheap cost with an ability to become a 2/2 creature but by the time this portion of his ability kicks in a 2/2 ally is not generally any good anymore. He adds a bit of graveyard control great vs recursion decks and decks needing a certain requirement in graveyard to achieve an effect. Rotling also has potential with Haste builds where you can get great value in cost vs stats. His low cost allows him to combo well with attachments and growth/stat boosters. Rotling also has synergy with exile builds as a potential outlet. Notes: With 3/1 stats Runt makes a pretty good Turn 2 ally going first or at least a threatening ally that must be dealt with going second. Being played as an ally leans him more towards rush and/or haste builds. Generally Plightbred Runt is included in your built to be discarded for the potential mass buff to your other friendly allies. This requires having discard outlets such as Falseblood Cultist, Abomination Factory (Mages), Antimatter (Elemental), or other sources. The overall tribe growth pattern is very combo oriented and Runt’s dual use helps to consolidate deck space and spread some growth to all available allies. 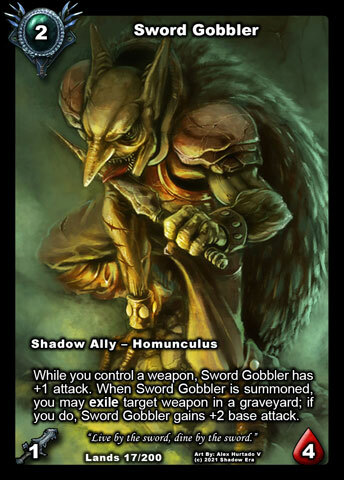 Notes: I have not used Sword Gobbler yet but he is quite an interesting ally. While having great synergy with weapons, he can also be used as tech against weapon based heroes attempting to recycle their weapons. This could be a strong card in upcoming release seeing as there are a few Warrior cards that revolve around Seeking and Recycling weapons. This also pairs with the Exile theme and Warped Desert Location. 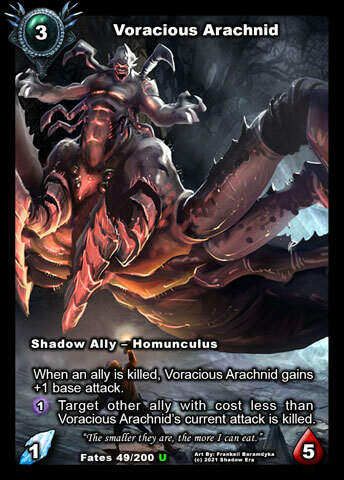 Notes: Voracious Arachnid is a strong ally for the Homunculus Alignment. He creates a defensive option that is capable of growing into a very large offensive threat and with his ability is able to deal with multiple targets on his own. He is a Tower Ally type that requires both investment and protection which are available in a variety of styles. 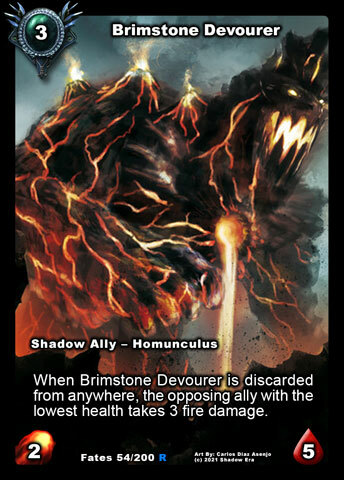 Notes: Brimstone Devourer is a dual use ally generally include in a deck to be discarded, with a secondary use of actually being used as an ally. He has some decent stats so using him as a 2/5 ally is not a bad choice especially combined with the Homunculus Growth options. Brimstone Devourer’s discard function is considered a pseudo spell and will not be considered using an ability card for the purposes of Evolving Abomination. Devourer appears in Discard builds and has both Fire Attack and Fire Ability damage so it is not uncommon for him to splash into Fire Themed builds. 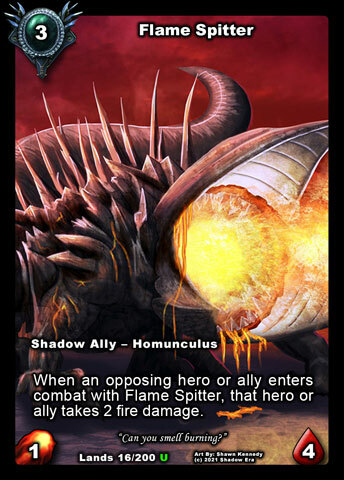 Notes: Flame Spitter is both an offensive and defensive ally. Spitter has the pseudo defender Fire Ping which lend very well defensively. Offensively the ping and actual combat attack are treated as 2 separate sources which is weaker against armored allies. The 2 separate sources are also stronger when enhanced with various effects such as Raikka’s ability or Infernous’ passive. Notes: Gravemonger is a beast when summoned from the hand when his ability is able to kick in. 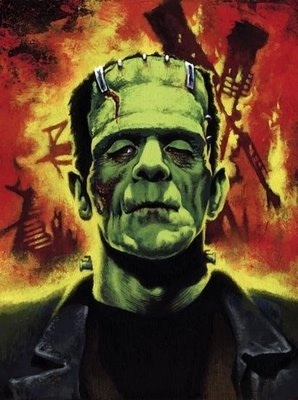 Gravemonger has excellent base stats for cost which only become better and more threatening once you can trigger his ability. Cost to potential damage ratios are very high meaning he can combo effectively with Haste sources. 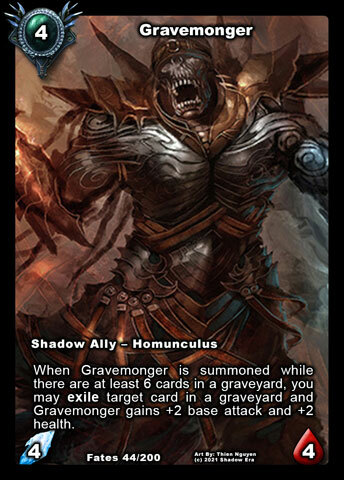 The Homunculus Alignment in general will also be feeding from your own graveyard so you need to build a deck properly around getting to his ability requirement. As more card are added with a discard function, you can increase the speed/odds of having your graveyard card count ready on a more consistent basis. Praxix can get to this requirement fast and early. Also the summon ability Exiles a card from any graveyard so you can use him in Exile builds as well. NOTE: The summon ability can trigger off cards in any players graveyard with at least 6 cards. Notes: Flameborn Defile is a great inclusion for the alignment for his immunity to Fire. This is a built in self protection to help him survive all fire attacks including Supernova. Additionally his ability is a passive so even if he gets neutralized on the board he can still offer benefits to your other fire damage outlets. 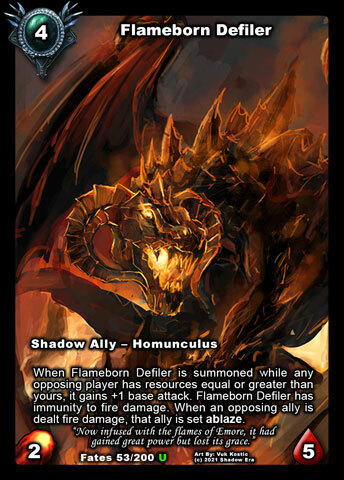 Defiler is great in Fire Theme builds (especially Gravebone/Supernova) and has great potential with being able to grow with the Homunculus. Fire Immunity makes him very splashable tech ally as well. Notes: Tar Scroll generally is going to be used in a fire theme build where you can max the potential. Typically I like to also combine this with discard functions to help feed the graveyard cards that Scroll can work with. Tar-written Scroll also has access to Exile give it lean to also work with Exile themed decks. 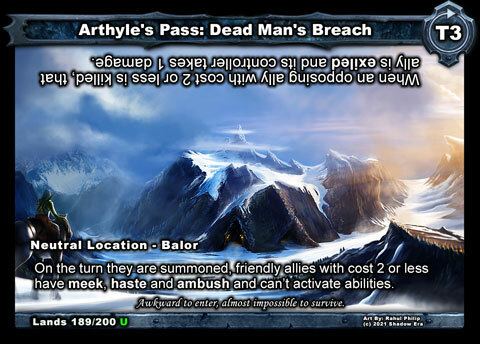 Also of note is that you can target cards in any players graveyard, so it can be tech against ally recursion decks. Notes: Flameforged Gauntlets is really only playable by the fire side of the Shadow Homunculus, with a lean towards Hunter and Mages whose Classes have access to additional fire damage sources. 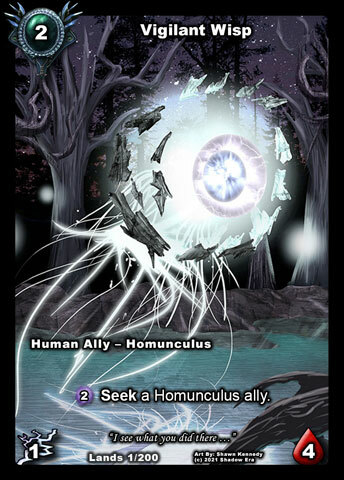 There are a variety of allies to choose, however you will probably need to play along with non-Homunculus allies to complete your deck. That being said you can still capitalize on some of the Homunculus synergies to enhance your decks variety. Draw is very important to the Homunculus alignment so this another way to draw during your turn. 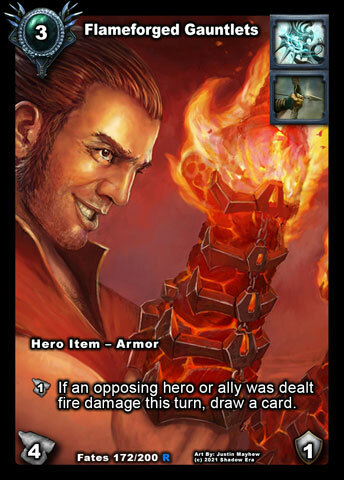 Note enflamed damaged on opponents hero/allies will happen on their turn so you cannot draw based on that type of fire damage. This is also an armor and great way to absorb some damage if you need to. 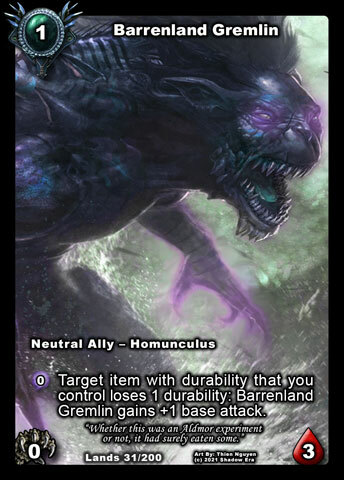 Notes: There are quite a number of low cost allies in the Homunculus alignment that can benefit from the use of Dead Man’s Breach, but mostly on the Shadow and Neutral sides. These allies can come in very strong with Haste and Aggressive stats generally capable of recapturing a lost board with the potential to grow stronger to help hold the board. Rotling, Sword Gobbler and even the NC ability all revolve around Exiling so this could also be paired with Void Wretch to get some ping damage to the opposing heroes. 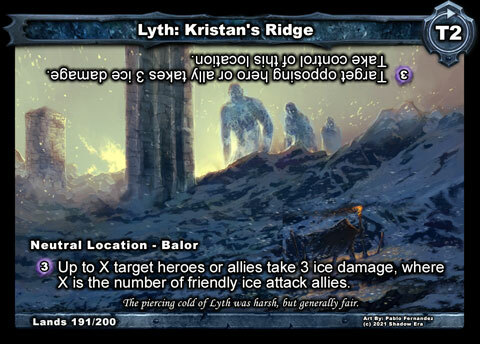 Notes: The Homunculus Alignment have several Ice attack allies making Kristan’s Ridge playable. 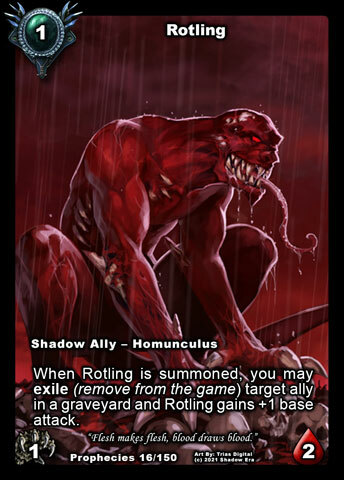 While you may need to include some non-Homunculus allies to complete your deck the Homunculus choices are very strong and aggressive. Being able to target one or more opposing targets can put this on par with Zaladar type effect with potential for more targets. There are currently 5 Ice attack allies (3 Homunculus) with a cost of 2-3 resources and with a well crafted deck you can capitalize on there synergy. Note as more ice attack allies of any type are added this location gets further boosted. Notes: The Shadow side of the Homunculus has the most amount of permanent growth options, so Proving Ground fits them very well. 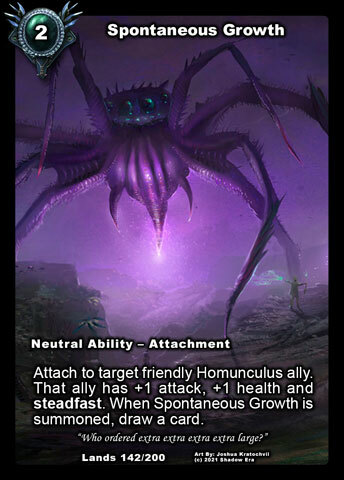 For the low cost Shadow Energy investment you can not only grow all of your Homunculus allies but you can draw a card as well. What is also cool is that this can trigger off any ally gaining permanent stats so you can mix with various heroes (Elementalis, Bloodfang) and/or various allies (Rampant Krygon, Dread Wolf, etc). They have a general mid-higher cost with overall lower attack value, needing to be enhanced in some way. 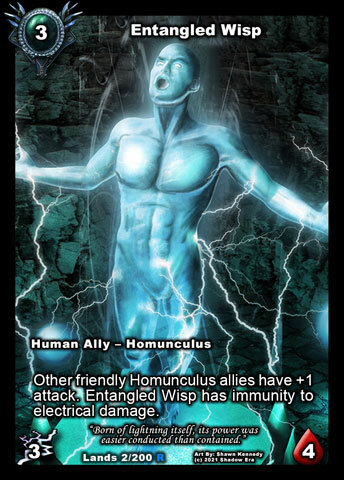 Notes: Vigilant Wisp is an interesting ally in that he helps fill the 2cc role of the majority of Human Homunculus builds. He has great survivability, though limited to only being able to attack the board. This is not always an option as the low base attack generally means you will take retaliation damage and so look for other options to increase the attack value. Note: Groundshift temporarily removes passive abilities (Meek). 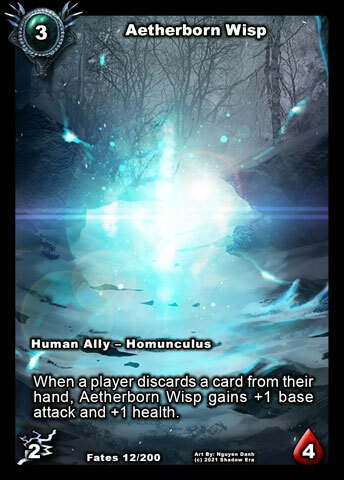 Vigilant Wisp as has a great active ability to help Seek out the right Homunculus allies to be played from your hand. This Seek cost is paid in Shadow Energy allowing you to still have the resources in your hand to be able to play the cards just acquired. Notes: Radiant Wisp is a good ally for decks looking to run attachments. 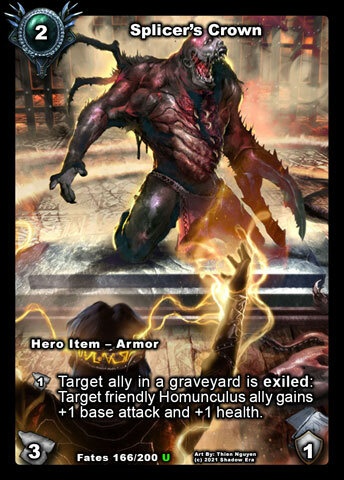 Human Homunculus all have low base attack and so rely on other cards to boost their attack such as attachments. What is special Radiant Wisp besides the additional growth, is that when Radiant Wisp is killed the attachments will recycle back to your hand and be able to be replayed onto another ally. Where this benefit becomes tricky is when the attachment has an on death benefit (ex Treasured Heirloom). In this case the passive of Radiant Wisp will trigger the bouncing of the attachment back to hand, prior to the attachment being able to trigger and you will not draw a card. 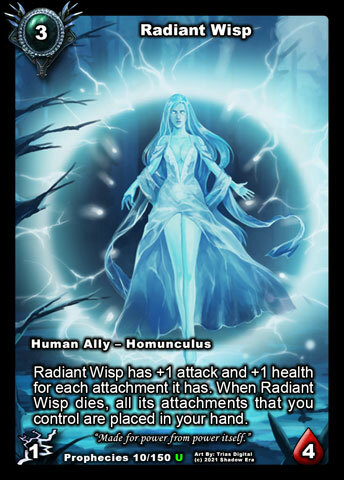 Because of the recycle effect, Radiant Wisp can play favorably in non-Homunculus Attachment based builds. Radiant Wisp will become stronger as more attachment are made like Spontaneous Growth and Ellos’ Resolve. Notes: Aetherborn Wisp is a very strong ally in a discard themed build and can grow quite large very fast. There are a surplus of discard outlets in varying types, (Glimmer of Hope, Sabreen, Abomination Factory, etc) however Templars have the most outlets so it would not be too far a stretch for there to be a mixed theme build. 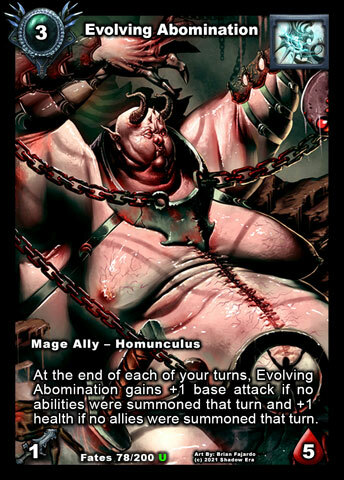 Within the Homunculus alignment most of the synergy comes from Abomination Factory and being able to buff other friendly Homunculus allies when Aetherborn is already grown or is not available. Aetherborn has weakness however to single threat removal card which can cripple your over time investments. Neutralizing Cards (Crippling Blow) are generally not a complete answer as humans have access to A Legend Rises and most likely Aetherborn Wisp has been growing and ready to smash. Notes: Entangled wisp is a pretty straightforward ally. The has excellent synergy with electric attack allies and fills the role of Aldon the Brave but better, since Entangled Wisp is not unique. Entangled Wisp is really good to put along side the other Human Homunculus due to their low base attack. Notes: Fortified Wisp is a very hard to kill ally. He essentially is like a Sandworm but cheaper and with the potential to grow more threatening. 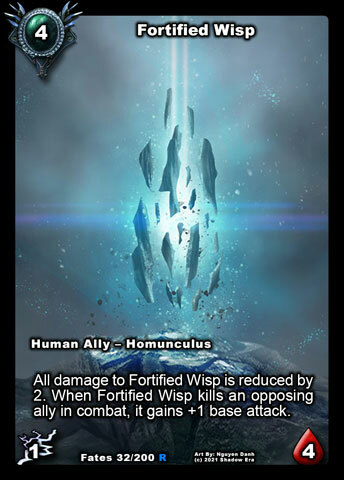 Fortified Wisp generally pairs favorably with Protector, Attachments and things to help increase its attack. Fortified Wisp can be used to initiate chip damage or alongside other damage sources to get the killing blow and become more independent. Notes: Growing Bog-dweller is most notably the odd ball of the Human Homunculus Alignment and fits more within the Neutral category. Growing Bog Dweller does not have electric attack and thus does not play very favorably with Aetherborn Wisp. Bog-dweller however does gain permanent stats from his activated ability and has 2 extremely great targets to pair with, being Eternal Troll and Clockwork Soldier for being potential continuous food sources. His ability is also a great way to minimizes ally board count and/or remove a useless ally. 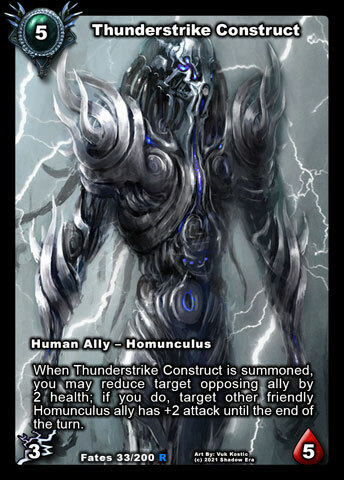 Notes: Thunderstrike Construct is a great ally fatty ally and very synergistic to the human faction, having electric attack and temporary growth (for other friendly Homunculus ally). Additionally his on summon health reduction really helps put baddies into kill range for your other friendly Homunculus allies who generally have low base attack. Construct also works well with various heroes (Weapon Based, Ability Damage Based, Ally Attack Based). Notes: While Brothers Landing is mostly geared towards the Templar Alignment, its discard function can work with Aetherborn Wisp to help accelerate its growth. This most likely would also be used in conjunction with Radiant Wisp and/or a heavy attachment type build to ensure that you have enough targets to justify using this location. Notes: There is not any synergy with the Homunculus allies, however the Seek plus reduced cost is something worth playing with. Most notably this would be used with Stalactitan, Thunderstrike Construct and Void Wretched all being interesting choices on their own but not necessarily together, which put this in the loosely playable category. This location does not replace Vigilant Wisp who can see the lower cost allies such as Entangled Wisp for the electric attack boosts, but could be used along side as an alternative option. Notes: There are a lot of Homunculus allies with electric attack so this becomes a natural pairing. This location helps you to stay low on resources while being able to play lots of cards from your hand. 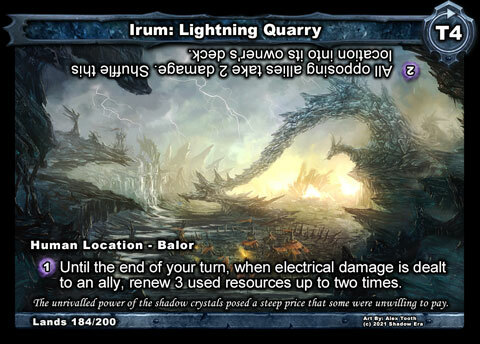 This is however dependent on your opponent having allies for you to deal electric damage too and your being able to draw enough cards to justify all of the resource renewal. Mages and especially Nishaven have additional ways to deal electric damage to capitalize. This section of Homunculus allies are a bit mix and match helping to fill roles in various builds in and outside of the alignment. Notes: Barrenland Gremlin is able to grow into a threat by eating the durability of your frinedly items (Artifacts, Weapons and Armors) as well as grow from other Homunculus growth accelerators. This versatility puts him as a favorable ally in early game builds also using items with durability. Though very combo oriented, Gremlin has the potential to be the strongest single ally by turn 2 with the right combination of cards. Turn 1 Gremlin, Turn 2 Abomination Factory discarding Plightbred Runt and you will have a ready to a ready to attack 3/5 ally (Gremlin eats 1 durability of Abomination Factor = 1/3, discard Runt = 2/4, Target Gremlin for Homunculus growth of Factor = 3/5). The other closet combo to this setup is 3 Spark combo where you would have a 3/3 Spark ready to attack, with 2 other 3/3 Sparks on the board. 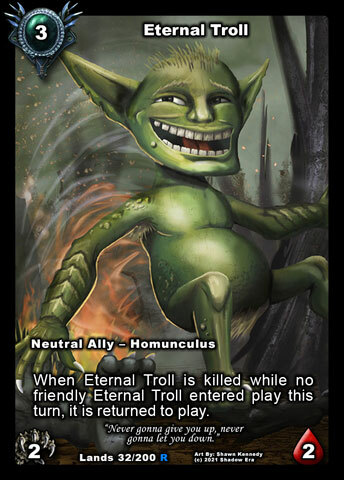 Notes: Eternal Troll is an excellent ally simply due to his survivability and potential for absorbing continuous damage. As long as he is not killed on the turn he enters play or killed twice in one turn he will re-enter play as a 2/2. I like to use Eternal Troll with Attachment builds as he increases the chances of having a target available. I also like to use Troll in Growth builds as he becomes harder to kill and either absorb more damage or begin surviving to retake control of the board. Troll also becomes one of those allies that is good to play alongside Gobblers (Ogloth, Growing Bog-Dweller, etc.) to be used as continuous food for their growth. Troll also becomes a good target for friendly kills for benefit use such as Sacrifical Lamb, Final Flourish, Energy Extraction, Energy Discharge, and Conversion, provided timed properly. Eternal Troll is not unique in that you can have multiples in play at a time, however the passive ability is unique and it 2 are killed at the same time only one will come back. Notes: Armored Packbeast is an interesting ally because he bring a form of healing that is accessible to all heroes, including Shadow Mages. This healing is a weaker form of Damage Reduction to your hero as the healing comes at the end of turn so if your health falls to 0 you will die prior to healing. Also with Packbeast being armored and having damage reduced (self) allows him to absorb damage as a form of pseudo healing as well. I like that he gains attack once he becomes damaged allowing him a chance to retaliate in non-Homunculus builds. Armored Packbeast healing can stack, and while they cannot heal themselves they can heal each other. Note once Packbeast is healed to full health he will lose his attack bonus. Notes: Stalactitan is a pretty interesting ally. His presence creates another ice attack ally to go along side many of the other exiting options. 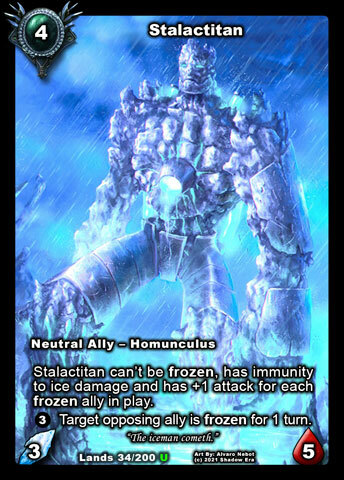 Stalactitan has great synergy with freeze decks especially Voice of Winter. Being able to hit the board before VoW and ever come onto the board without having to pass through the freeze stall. He can also play with cards Forgotten Horror without becoming frozen. Being the Stalactitan gains attack for each frozen ally this helps steer him away from stalling the game and it remaining a slow pace as he can deal potentially lots of face damage. I only see his strength increasing as more ice things are added to the game. Notes: Void Wretched is primarily going to play in builds that contain locations and/or are exiled themed. 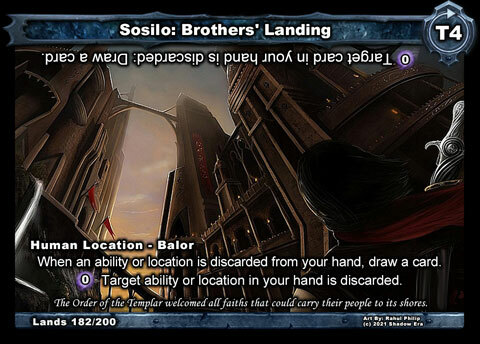 The summoning reduced cost based on location counts helps to get this onto the board sooner, however to achieve a super reduced cost it will be dependent on your opponents also playing with locations or your playing with multiple different locations and/or locations that you can tempt your opponent into stealing (taking control of). This is due to the fact that if you control the current location you cannot play a new location of the same type. The exile part of his passive ability is also pretty interesting as it turns all exile sources into ability damage to opposing heroes. 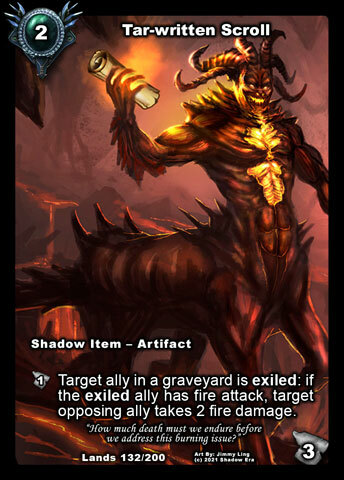 The activation ability helps feed the damage portion of his passive by allowing Wretch to exile the current location. This can be extremely useful if your opponent controls the active location or if the location you control has a strong NC ability that you do not want the opponent to use. With Void Wretch not being unique you can actually stack the exile damage to opposing heroes. 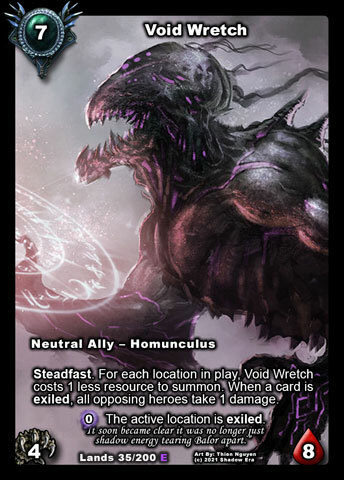 Wretched is also the only 7cc ally that has Steadfast which can put him into playable range outside of the alignment. 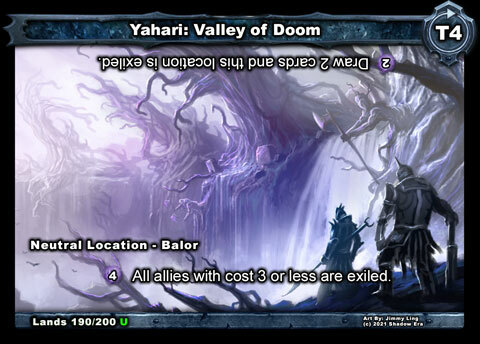 There are several locations that he can work favorable in, Braxno Citadel – NC exiles the location = damage to hero; Warped Desert – C exile and put card in hand = damage to hero and “draw”; Dead Man’s Breach – NC when your 1-2 cost friendly allies are killed they are exiled = damage to hero; Valley of Doom – C exiles 1-3 cost allies = damage to hero. There are a variety of other cards that can perform exile functions that Void can work with too. 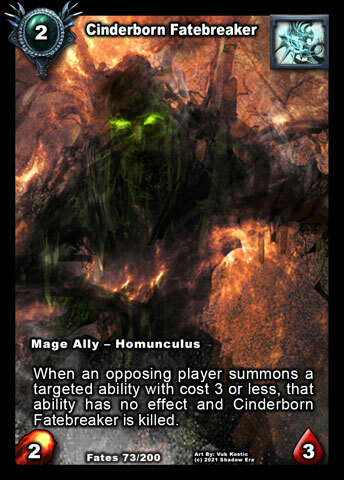 Notes: Cinderborn Fatebreaker is an excellent blocker for the Homunculus Alignment. Often you invest a lot of cards into growing one of your other allies just to have him easily neutralized by a low cost card. Cinderborn also blocks targeting abilities to your Hero such as Fireball, but has no effect against cards that auto apply such as Blood Frenzy. This protection type ally makes for a great splash ally in Fire Theme builds and with 2/3 stats really any Mage build. Notes: Evolving Abomination has some really great growth potential, but it is hard to control making him a bit inconsistent. In addition to summoning Abomination, you may also still have to react to what your opponent does potentially resulting in no growth if you play an ally and ability in same turn. Your most consistent play will be on Turn 3, where you do not have the resources to summon additional cards, resulting in a 3/4 at the end of your turn. The delayed growth pattern also make him hard to abuse with haste or surviving initiated retaliation attack. His best qualities are that he can grow and become threatening so he is always a threat on the board that has to be dealt with. Crippling Blows and other disabling attachments allow your Evolving Abomination to grow and if your smart enough to be playing with Attachment Removal you can get some extremely great value. Additionally, trying to play without Abilities, and focusing more on Artifacts and Discard Mechanics can lead to a more consistent growth pattern. 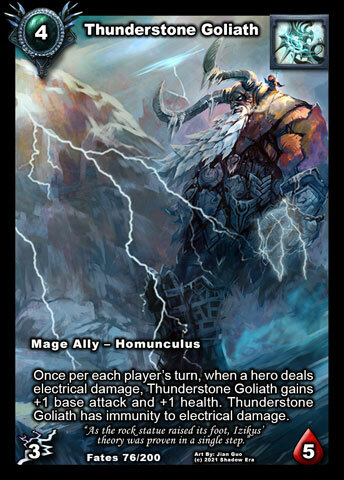 Notes: Thunderstone Golem is a pretty cool ally. He is limited in flexibility due to the number/types of Hero Electric options that are currently available. He pairs most favorably with Nishaven as he survives both a Nish Blast but also grows from it. He is an excellent tech against Human Homunculus (Electric Attack) and even Zaladar, being able to survive a Zal blast but can take some damage from a carefully timed Mind Control. Additionally he is one of those ally that can hurt you if he gets stolen and played by your opponent due to his immunity to Electric, which you generally are packing in order to buff him. Notes: Spontaneous Growth is a fantastic attachment for the alignment, doing three important things. Increasing the allies base stats, drawing a card and gaining Steadfast. The increased stats are nice and is a great synergistic way to work for both factions. 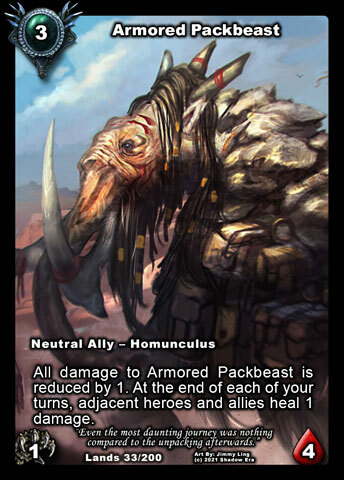 Steadfast is an important Status to gain as with Homunculus you could spend a lot of time investing in a single ally to have it bounced back to your hand by cards like retreat. Steadfast will also prevent Exiling tactics. Drawing a card is also important because Homunculus decks can often become very card starved. Notes: For Mages this is the only Class Attack booster to the Alignment. This can be combined with Plightbred Runt for accelerated growth or Brimstone Devourer for growth/ability damage. As more discard abilities become available this only increases in value. 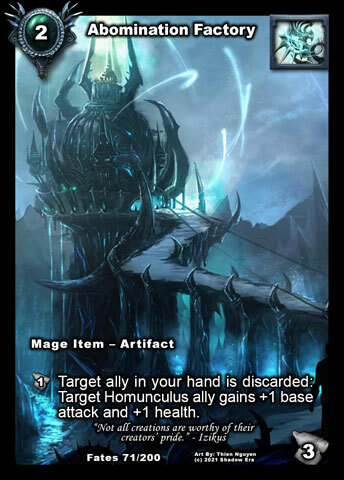 Abomination Factory can be used outside of Homunculus builds in decks specifically just looking for Specific discard outlets (Gravebone). Notes: Splicer’s Crown allows you to focus your growth feeding ground into all available graveyards. Can be used as tech because you can break up opponent Recursion decks by removing their options to Frankenstein your allies up. It’s nice this is an armor, but really I wish it was just an item so opponents couldn’t beat down the durability. This also pairs with Warped Desert as a way to steal opponents allies while growing yours. 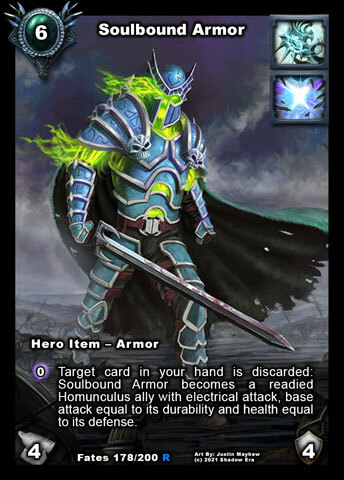 Notes: Soulbound Armor is the ally with the highest readied (super haste) attack power combination. It comes at a steep price of 6cc + discard, but the versatility of the card more than makes up for the cost. The armor alone is great reducing 4 combat damage for up to 16 damage. You can also time this card properly with card that you want to be discarded to maximize the discard cost function. 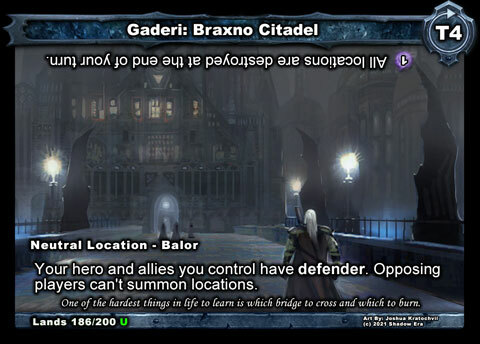 Notes: Braxno Citadel is an interesting choice for the Homunculus alignment because of their potential growth factor. 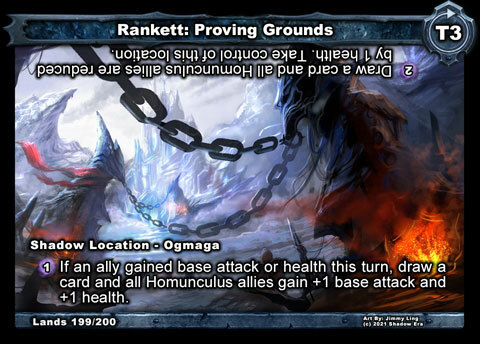 Increasing attack strength forces opponent to use ability damage or take some pre-retaliation damage. Blackened Heart is an interesting attachment along side Defender. This also works with Void Wretch (see above) as well as location tech and slowing opposing hero ability down. 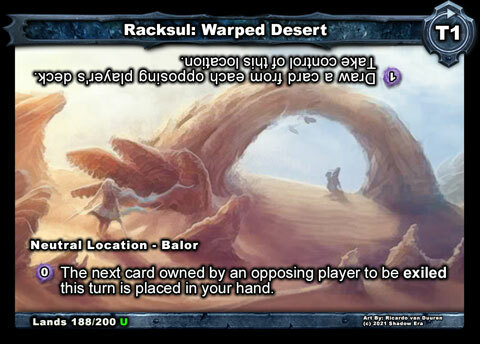 Notes: Warped Desert is an interesting location designed at working with Exile and also playing with opponents cards. Since this is reliant on what the owner has in their deck it would be considered not a reliable way to play, however there are a variety of ways to exile various cards so it would also take into consideration on how your deck is built. 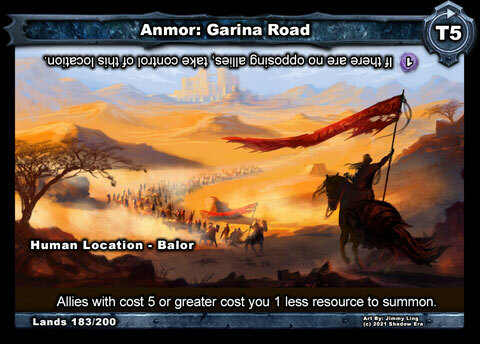 Note: Loest is a great hero to use with this location as his exile can target a larger range of cards. The active to exile a card every turn works in favor of Void Wretch as a hero ping condition as well. 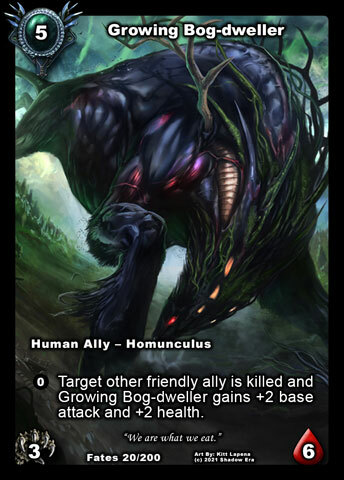 Notes: Valley of Doom is not necessarily the best location to use with Homunculus, however they do have access to Spontaneous Growth, Assumed Command and Stand Firm which give Steadfast to allies making this fairly interesting. Combined with Void Wretch and your allies can ignore the board and go for the hero combined with ping damage. Tagged attachment, claw, discard, electric, exile, fire, growth, human, ice, items, lost lands, neutral, Shadow, Shadow era, shattered fates, tower ally.